It took little time for a fire to destroy an entire neighbourhood in the Colombian town of Riosucio. It was seven o’clock in the evening in May 2010 when flames erupted from El Cucarachero, a brothel on the banks of the Atrato River. Everyone rushed to watch, but as it was the workplace of the women known locally as ‘caimanas’ [alligators], no one tried to put out the fire. “It must be something from God to burn the house of sin,” they said, as the flames consumed the wooden structure, which was usually lit by candles. Suddenly the wind blew harder and before the fire was under control, thirty-six houses had been reduced to ashes. Silvia Rojas, 80, lost everything. Now she is living with her granddaughter in dilapidated temporary housing. Riosucio, home to 29,000 people is situated in Chocó, one of the poorest, remotest and most corrupt regions in Colombia. To get there from Bogota involves two plane rides, a boat and two journeys by jeep. Illegal armed groups wield power in a region which is rich in natural resources yet has some of the poorest living conditions in the country. Riosucio has no aqueduct, an inadequate sewer system and suffers severe flooding every year. The twin challenge for the authorities tasked with reconstructing the area razed to the ground by fire, was to reduce people’s vulnerability to flooding while also improving the dignity of a population living without sanitation. Carrying out the reconstruction was the Risk Management Division (DGR, in Spanish) of the Ministry of Interior and Justice, supported by specialists from the National Learning Services (Sena). Sena believed that changing weather patterns could lead to increased flood levels within a few years, and recommended elevating the new houses to a height of 2.5 metres supported by concrete columns. “When we mentioned the idea there was laughter and ridicule. ‘Why so high?’ everyone in town said, as they had never built to a height exceeding one metre,” says Luis Eduardo Montoya, an expert from Sena. It was agreed to build the homes 1.8 metres above ground with the possibility of raising the houses further with jacks if necessary. It wasn’t long before the theories construction was tested. In the middle of the rebuilding project, in November 2010, rains brought the worst flooding Colombia had suffered in recorded history. Five hundred times more rain fell than in previous years, according to official data. The entire town of Riosucio was underwater and flood levels on the site of the new homes rose by 1.7 metres and in some areas by up to four metres. Four children and a woman drowned and more than 3,000 people had to abandon their homes. But the new houses, though unfinished, were the only ones unharmed. The flood waters rotted the bases of many of the town’s wooden houses, but the concrete columns of the new homes remained intact. “Now we expect this pilot project to be an example, not only for future construction in Riosucio but for the hundreds of towns vulnerable to flooding across the entire country”, says Dagner Mosquera, Riosucio’s planning secretary, who expects the project to be finished in June. Each new home is to measure 70 square metres, bigger than most of those which burned down, with two bedrooms, a living room and a bathroom: a novelty for most homeowners, accustomed to using the river as a bathroom. The scheme also planned for tanks to collect rainwater and a sewage filtration system to return wastewater to the river with 90 per cent purity. “This project has taught us that we have to be made of iron, like these people in Riosucio, to confront difficulties and find solutions. In the city we have everything, but here we have to work in the middle of poverty”, says Luis Eduardo Montoya from Sena. “From the beginning our commitment, despite any obstacles, was to not stop building. So regardless of the rains, we kept on working. During the floods the workers worked from canoes with half their bodies in the water. The current took some building materials with it, but we didn’t stop working even then”, says the architect Gonzalo Florez, from DGR, the project’s manager. As Colombia struggles to cope with the aftermath of its current rainy season, thousands of people across the country are living in shelters waiting for the reconstruction of their towns. Ricardo Lozano, the director of Colombia’s National Institute of Hydrology and Meteorology (Ideam) said. 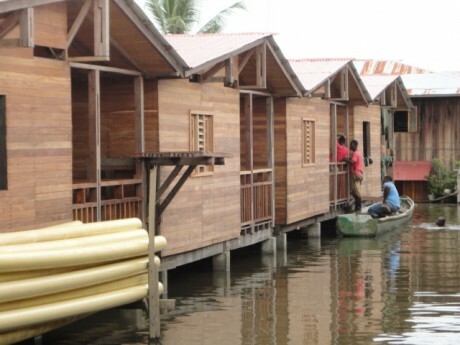 “These houses are useful to face the challenges that come with seasons of extreme rain and drought. We have seen this changing climate in Colombia during the last 20 years. This project in Riosucio is very important in thinking about changing the face of housing, because, as the president Juan Manuel Santos said: ‘climate change is here to stay, and it will’. This feature was first published by the Spanish newspaper El Mundo. It was produced as part of a fellowship with Climate Change Media Partnership, an initiative of Internews, IIED and Panos. Planners seized the chance to build homes designed to cope with Riosucio's increasingly devastating floods. More houses like these will be needed to adjust to Colombia's 'new climate reality'.